Superior business performance almost always guarantees superior stock returns. But one stock has been defying this logic on Dalal Street all of this past decade. Shares of Coal IndiaNSE -0.06 % have slipped 20 per cent this decade despite having an RoCE (return on capital employed) of between 25 per cent and 60 per cent since 2008, a high dividend payout record and robust capital efficiency ratio, read RoCE. 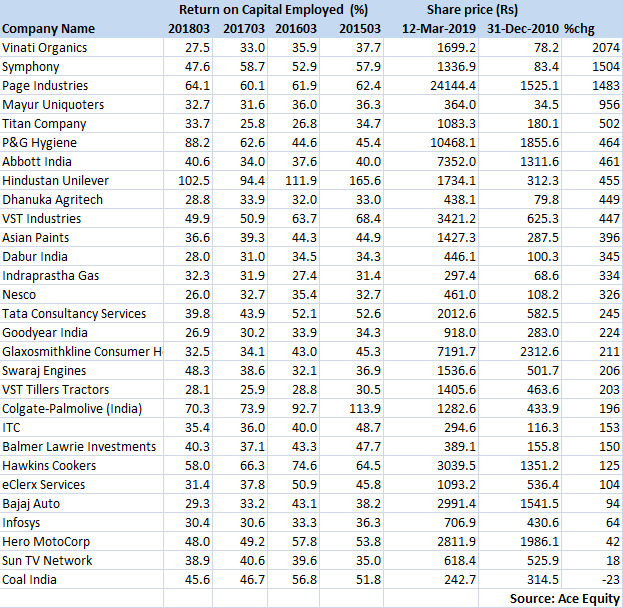 As many as 28 other stocks on BSE with consistent RoCEs of over 25 per cent have rallied up to 2,100 per cent in these 10 years. Specialty chemicals firm Vinati Organics topped the list with 2,074 per cent returns since December 2010. The company also delivered over 25 per cent RoCE in last 10 years. Other stocks with consistent RoCE included Symphony (1,504 per cent), Page Industries (up 1,483 per cent), Mayur Uniquoters (up 956 per cent), Titan (up 502 per cent), P&G Hygiene & Health Care (up 464 per cent), Abbott India (up 460 per cent), HUL (up 455 per cent) and Dhanuka Agritech (up 449 per cent). RoCE is the measure of earnings before interest and taxes (EBIT) for every rupee of capital (equity and debt) employed in the company. In other terms, it measures the capital efficiency of the company. Analysts often prefer this matric to value a business. Some analysts say government policies coupled with environmental concerns and a slowdown in the economy affected Coal India in last few years. Others say it was a high base effect of pricing. On the listing day, the stock fully priced in the fundamentals of the business. Over the years, production rampup leading to a drop in price realisations and increased focus on renewables dampened sentiment on the counter. Meanwhile, regular stake sales by the government in PSU firms are keeping investors cagey. When Coal India got listed, the government held 90 per cent stake in the coal monopoly. Today, it holds around 73 per cent. Analysts still look at the stock as an attractive investment bet with a 3-4 years outlook, citing expectations of a pickup in the economy. “Investors want return either in the form of dividend or stock price appreciation. From an investment perspective, Coal India will become a very good investment bet on hopes of a rise in dividend yield. We may see a hike in dividend as PSUs are being forced to give higher dividends. Those who invest in the company at current price level may reap the fruits in 3-4 years due to a revival in the economy,” said Sanjeev Jain, Vice-President for Equity Research at Sunness Capital. While the stock has not appreciated in value, its high dividend payout has resulted in 60 per cent or more return for investors since its listing. During FY12-18, the company gave a dividend of around Rs 140 per share. “We have not been overweight on this PSU pack for a long time. Tactically though, things may improve for PSU stocks now. Coal India may be one among the few to bet on, going forward,” said Amar Ambani, President & Head of Research at YES Securities. Jain says once the problems related to power and infrastructure companies get resolved, Coal India will emerge as a frontrunner to tap the opportunity as these businesses use coal in bulk. The government held 72.91 per cent stake in the company as of December 31, 2019, while foreign portfolio investors, mutual funds, insurance companies and other financial institutions held 5.99 per cent, 5.38 per cent, 9.73 per cent and 2.49 per cent, respectively. Individual investors hold less than 2 per cent stake in the company, which does not help better price discovery. “Fair price is an issue for Coal India due to lower individual holdings, as institutional investors hold their stakes for the long term,” says Jain. “Investor should consider companies with higher RoCE. They give good returns to investors over time. However, RoCE alone is not important. There should be at least 10 per cent topline growth. 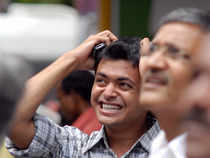 Companies with high RoCE mostly comes at expensive valuation,” says AK Prabhakar, Head of Research, IDBI Capital Markets.